8/55 Reagen Sulewski Another brilliant 'gimmick' film from the pen of Charlie Kaufman that maybe hits too close to home. 21/92 David Mumpower I admire this movie more than I enjoy it. 21/126 Kim Hollis Depressing and optimistic all at once. 25/48 Les Winan Kaufman, Gondry and cast keep things interesting, as always. But why does it seem like a whole lot of sound and fury signifying nothing? Shouldn't there be a better movie here? We've all had that unforgettable romance that never completely left our mind. 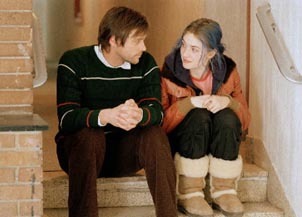 Eternal Sunshine of the Spotless Mind explores this theory in a manner befitting the mad genius of writer Charlie Kaufman. The simple concept is that Clementine Kruczynski (Kate Winslet) has had a medical procedure performed to erase the memory of ex-boyfriend Joel from her mind's eye. Since the ex is none other than Jim Carrey, I'm certain a lot of us would settle for simply deleting the horror that is Dumb and Dumber from our minds; however, just eliminating everything he's done isn't a bad fallback option. The fallout from Joel being erased from Clementine's mind as easily as if he had been an old episode of Three's Company is that he decides to reciprocate. He signs up to have the same procedure to remove his memories of her. The movie is told as a series of Memento-esque rewind sequences within Joel's head as he replays the best and worst of times from their two years together. Since the recollections are shown in reverse order, the first pieces erased are unpleasant moments from around the time of the break-up but as the memories grow fonder, Joel reconsiders his decision. He begins to stash the files marked for deletion into other parts of his brain, but this has unexpected results. Other parts of his past are marred by the unexpected encounters with his overwritten memories of Clementine, causing hilarious results.